Getting into and out of the shower can be challenging for individuals with limited mobility. A shower transfer bench can provide the aid necessary to make this process significantly safer. 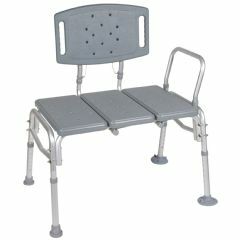 Sometimes referred to as a tub transfer bench or a bath transfer bench, they are made from a variety of materials like aluminum, plastic, or a combination for durability and stability. Allegro Medical offers a wide selection of transfer benches from padded to adjustable to portable in order to meet whatever your specific needs and requirements might be.